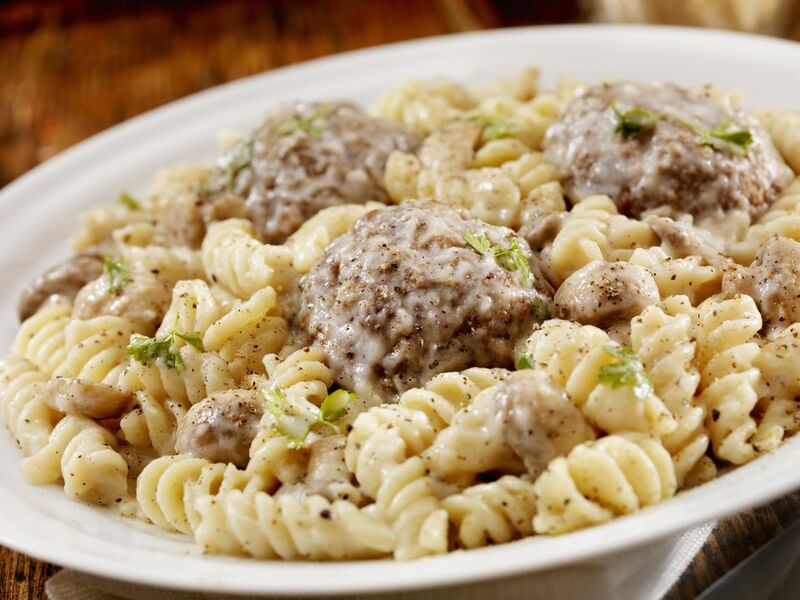 Meatball Mac and Cheese is a wonderfully rich and comforting recipe perfect for family dinners. You can make it ahead of time, cover and chill it in the fridge. Then just add 10 to 15 minutes to the baking time and serve it when hot and bubbly. Serve this rich and hearty recipe with a green salad tossed with some sliced mushrooms and drizzled with ranch dressing. You could add some steamed asparagus or green beans, but you don't have to for a complete meal. Preheat the oven to 375°F. Spray a 9" x 13" glass baking dish with nonstick baking spray containing flour and set aside. Bring a large pot of salted water to a boil. Add the penne to the water and cook according to the package directions. Meanwhile, in a large saucepan, melt the butter over medium heat. Add the onion and garlic and cook until tender, about 5 to 7 minutes. When the pasta is done, drain well and set aside. Add the Alfredo sauce and milk to the onion mixture and heat until steaming. Add the Havarti, provolone, mozzarella, and 1/2 cup Parmesan cheese to this mixture and cook over low heat until cheese melts. Stir in drained pasta and the meatballs. Pour the mixture into the prepared dish. Top with the remaining 1/4 cup Parmesan cheese. Bake for 25 to 30 minutes or until the casserole is bubbly around the edges and the cheese starts to brown on top. To make ahead of time, do not bake; cover and refrigerate up to 24 hours, or freeze up to one month. Bake chilled casserole for an additional 10 to 15 minutes. Thaw the frozen casserole in the fridge overnight, then bake until hot and bubbly.